There has been a lot of talk about canister gas and cold weather. Let's see if we can separate some fact from fiction and make sense of things. In this article, I'd like to discuss what regulator valves and inverted canisters can do for the cold weather backcountry traveller. But first some background. If one goes high enough, it can be cold any time of the year. Who cares about Cold Weather? You do. Well, if you intend to cook with canister gas, you do. Why? Well, the colder your canister gets, the less pressure it has. On a hot day, the gas will come blowing out of your canister with great force. On a cold day, you'll barely hear a hiss of escaping gas. Without a decent flow of gas, you can't get a proper flame, and, on a really cold day, you simply can't cook. Particularly for mountaineers, the only way to get water is to melt snow. With no canister pressure, if you need to melt snow, you can't. No melting snow = no water = dehydration, and that's bad because dehydration can hasten hypothermia. Hypothermia is extremely serious and can be fatal. But even if you're not a high elevation mountaineer, having to eat an uncooked backpacking dinner is pretty unpleasant and forgoing a hot beverage on a cold morning nearly equally so. With respect to warming the canister, really, it doesn't matter what the air temperature is provided that you can keep the canister warm. But can you realistically keep that canister warm when it's really cold out? Notice the frost on the lower part of the canister. The temperature was above freezing at the time this photo was taken. Canisters cool from within as you use them. On a seriously cold day, that little metal canister can get very cold very quickly just from being out in the environment. Here now is where technology comes in. Technology can give us an edge. Technology can make it so we are a bit less dependent on temperature. While technology can help us, there's no substitute for the basics. What are the basics? We then use technology in conjunction with (NOT in lieu of) the basics. With respect to the basics of cold weather gas stove use, I here refer you the article I re-wrote in 2014: Gas Stoves: How Cold Can I Go? Wouldn't a nice, hot beverage be just the thing on a morning like this? Uh, you did choose the right stove technology before your trip, didn't you? 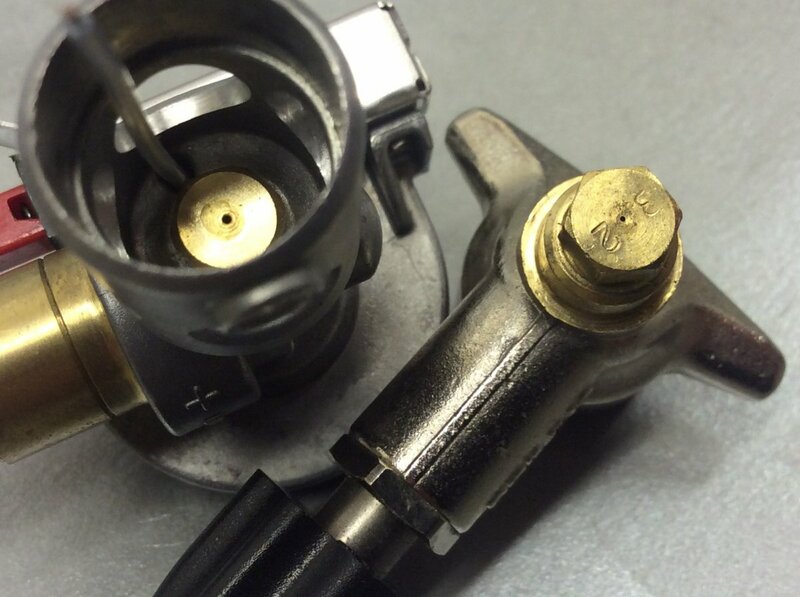 What is a regulator valve, and how can it help? There are several layers here, so bear with me. It should make sense in the end. First, a regulator valve has a pressure regulator built into it. This pressure regulator can insure that no more than a certain flow of gas is fed to the burner at a time. Uh, Jim, that's great, but I thought you said the problem was not enough gas. Now, you're talking about a device that prevents too much gas. Well, yes, and here's the issue: A stove has to be able to operate safely in hot weather as well as cold. If the stove designer "opens up" a stove too much in terms of gas flow, then there could be a disaster in the offing. Here's what I mean: It's a hot day. Your canister pressure is at an all time high. You open up your valve all the way without really thinking about it. The gas rushes through with such force that the flame lifts off the burner and is pushed out and away from where the gas is coming from. If pushed far enough, the flame will go out even though there was no interruption to the flow of gas. Now, let's think about this. We've got a red hot stove, and the flame is out. We've got volumes of highly flammable petroleum gas rushing out of the tank. Say, do you think that having a highly flammable, potentially explosive gas rushing toward red hot metal could be a problem? This could go bad very quickly. I think you get my drift here. If a stove designer opens up a stove too much, he or she risks putting someone into the burn ward of the hospital unless... unless there's a pressure regulator present of course. Now, with a pressure regulator, the stove designer can "open up" the flow all he or she likes without worrying about exceeding a maximum safe amount. If the canister pressure gets too high, the regulator steps in and inhibits the pressure. In cold weather, our "opened up" stove lets plenty of gas through, and we can cook even when the canister pressure is fairly low. If we calculate the cross sectional area of each jet, we find that the regulated jet's area is more than triple that of the non-regulated jet. You can get a lot more gas through that larger opening. A regulator valved stove, left (a Soto WindMaster). A non-regulator valved stove on the right. A non regulator valved stove can't be opened up like this; it just isn't safe. The designer has to build a non regulated stove such that it is safe at maximum canister pressure; there is no inhibiting regulator. He or she has to "choke" the stove, and cannot allow it to be opened up. When cold weather comes, a non-regulator valved stove doesn't have the capability to let enough gas through, and performance falls off quickly. A regulator valved stove can be built such that the stove can operate at near 100% flame when there is, say, only 15% of maximum pressure available. On the other hand, a non-regulator valved stove operated at 15% of maximum pressure will have a flame that is about 15% of maximum. Being able to have a 100% flame at, say, 15% pressure is the true advantage of a regulator valved stove in cold weather. Note that I'm using "15%" here. This number is meant to be illustrative more than it is meant to be exact. Each stove's design will be different. Ah, but what happens when pressure falls below that 15% mark? In that case, a regulator valved stove quickly loses performance. At truly low canister pressures, there is no real advantage to a regulator valved stove, and, no, I don't care what any stove company may tell you to the contrary. Technology only goes so far, and at a certain point, it can do no more. This is why I say one should use technology in conjunction with – not in lieu of – the basics of good cold weather gas stove operation. See links below for more information on the basics of good cold weather gas stove operation. The canisters contain 100% "plain" butane (not isobutane) with no propane. The canister temperature is near freezing, i.e. 32 Fahrenheit (0 Celsius). Butane vaporizes at 31 Fahrenheit (-0.5 Celsius). The canisters will cool from within as they are used. A canister needs to be about 20 Fahrenheit degrees (10 Celsius degrees) above the vaporization point of the fuel it contains in order to have good pressure. I think you can see that a regulator valved stove can only take one so far. Technology must be used in conjunction with good cold weather gas stove practices. Hopefully you now understand that a regulator valved stove, if is designed properly, can offer a distinct performance advantage in cold weather because it can be "opened up" whereas a non-regulator valved stove must be restricted in order to operate safely in all temperatures. I have been studiously avoiding going into much of the science behind all this. I don't want to lose people. Here, though, I have to talk just a little bit about the science or this will make no sense at all. But fear not. I am (I hope) a reasonably good communicator of things technical. If you can't follow me, then post questions in the comments, and let's work together on this. Why do canisters cool from within? Recall that I said that canisters cool from within. I even posted above a photo of a canister with frost on it – frost despite the fact that the ambient temperature was above freezing. Why do canisters cool from within? Well, this due to the contents changing state from a liquid to a vapor. Shake a half full canister some time. That sloshing sound you hear? That's liquid in there. Yes, I know that they're called "gas" canisters, but that gas in there is under so much pressure that it turns into a liquid. When you open the valve on your stove, that pressure is released, and the liquid inside your canister starts turning back into a vapor. There's just one thing. A certain amount of heat is required, the heat of vaporization ("HVap" for those of you who like such things). For example, let's say you want to vaporize water. Typically, one would put a pot on the stove and apply heat. The water heats up, begins to boil, and turns into steam. Steam is a vapor. Just as the water you boil in your kitchen requires heat in order for it to turn into a vapor, so also the liquid in your canister requires heat in order to vaporize. Where does this heat come from? The surroundings. In the case of your stove, that heat is taken from the canister and fuel. As one part of the fuel vaporizes, the remainder of the fuel (and the canister itself) gets cold. This is the same principle by which an air conditioner, refrigerator, or freezer works. In a refrigerator, freon (typically) is compressed into a liquid and then allowed to expand back into a vapor. The heat required to turn the freon into a vapor comes from the surroundings, and the air in a refrigerator is thus chilled. Think of your canister as its own mini refrigerator/freezer. The principle is the same. OK, so why this science background? Well the point is this: In order for a gas stove to operate, there has to be enough heat to vaporize the fuel. Gas stoves run on, you guessed it, gas (i.e. a vapor). You've got to have gas, not a liquid, to run a gas stove. In order to have gas, you have to transform the liquid fuel in the canister into a vapor, and for that, you have to have a certain amount of heat. Where that heat comes from matters. In normal operation, with the canister right side up, gas is drawn off the top. The heat required to turn the liquid into gas comes from the surrounding canister and fuel. If however you turn the canister upside down, then you are drawing liquid off the bottom. In drawing liquid, nothing is vaporizing in the canister. The liquid can then be fed to the burner. The burner. Get it? A burner is what? A burner is hot. Really freaking hot. In fact, there's all the heat we'll ever need at the burner to convert that liquid we've drawn off the bottom of the canister into a vapor so we can burn it. There's just one catch. Your stove MUST be designed to be able to handle this. The fuel has to significantly heated before it hits the actual flame in order for things to work properly. Typically this is done by means of a generator (a.k.a a "pre heat loop") such as the one in the photo below. A Kovea Hydra stove. Note the fuel line passing through the flame. As liquid fuel flows through the fuel line, it is heated greatly and expands into a vapor. By using the heat of the flame itself to vaporize the fuel, we don't have to worry so much about the temperature of our surroundings, and our canister doesn't turn into a mini freezer. Each type of fuel has a temperature at which it will vaporize. The lower the fuel's vaporization point, the easier it is to maintain good gas pressure in your canister in cold weather. The various fuels are blended together with the intention of providing a mix that will a) not have such high pressure that it will burst the canister in hot weather while b) still providing decent canister pressure in cold weather. Propane is going to vaporize all the way down to -42 C (-44 F). Propane is your best cold weather fuel. However, in normal right side up canister use, the propane vaporizes more readily and is drawn out of the blend at a faster rate. This is referred to as "preferential vaporization" or "preferential separation." Since you're pulling the propane out at a faster rate, you're burning it at a faster rate. This is referred to as "preferential burning." They're two sides of the same coin, and both are to be avoided. For example, if one starts out with a good cold weather mix, say 20% propane and 80% isobutane, by the end of the life of the canister, the propane will be all but gone. Your blend instead 20/80 will be more something like 1/99. Whereas your blend started with a nice percentage of propane (which will vaporize all the way down to -42 C / -44 F), you will finish with almost all isobutane (which only vaporizes down to -12 C / +11 F). You'll have lost that part of your fuel which was serving, in effect, as a propellent. Recall also that the fuel has to be about 10 Celsius degrees (about 20 Fahrenheit degrees) above its vaporization point in order for there to be decent canister pressure with most stoves. You cannot use a fuel just barely above its vaporization point and expect decent pressure. In our example, above, at the start of the life of your canister, you might have had a blend giving you good canister pressure down to maybe -15 Celsius / 5 F or even -20 / -4 F, but by the end of the canister, the blend you have left is maybe only good down to 0 Celsius / 32 F.
In order to retain an effective cold weather gas blend, we have to avoid the loss of our best cold weather fuel components. If we pull vaporized fuel off the top of the canister, as in upright use, the propane is just naturally going to come out of the blend faster. On the other hand, if we pull fuel off the bottom, as in inverted canister operation, it doesn't matter what vaporizes at what temperature. You're not vaporizing it! You're drawing off liquid. The liquid drawn off will be the same blend as the blend in the canister as a whole. Thus, when running with the canister upside down, your fuel blend does not change significantly. You start and end with roughly the same percentage of propane, your best winter fuel. Changing (for the worse) fuel blend. A stove designed to handle inverted canister operation. Which is best for what? Well, truth be told, either approach will work, so long as you can keep the canister "warm." By warm here, I mean warm relative to the surroundings, not balmy tropical weather. When it's -15 C (5 F) out, then 0 C (32 F) is "warm." It's just that when it gets really cold, it's hard to keep the canister warm. When it gets really cold, you want to use the technological approach that gives you the biggest boost so that you don't have to struggle so much with keeping the canister warm. "no chill and no change." No matter how well designed around a regulator valve a given upright canister stove is, there will still be internal canister chilling, and there will still be a change (for the worse) in fuel composition. Inverted canister use eliminates these two killers of cold weather performance. In practical terms, maybe an upright canister stove is best used in temperatures above something on the order of -15 C (5F) – and I'm assuming here that you're already using good gas and keeping the canister warm. Could you go colder? Sure, so long as you can keep the canister sufficiently "warm." I just think it's going to get increasingly difficult to keep the canister warm as the temperature falls. I've seen a pot of boiling water thrown into the air where all the water freezes before it hits the ground. That's cold. If you can keep your canister warm under those conditions, you're a better man or woman than I. So for really cold conditions, a stove that can handle inverted canister operation is the better choice. All you need is enough pressure in the canister to get the fuel to flow to and through the burner assembly. The heat of the flame will take care of the vaporization. You don't have to worry about the canister chilling from within, and you don't have have to worry about your propane preferentially burning off. Again, though, your stove must be designed for this. You can't just take any canister gas stove and run liquified petroleum gas to the burner. And, there's no law against combining the two approaches. In fact, there is a stove that does just that, the Jetboil Joule. The Jetboil Joule is a snow melting monster. 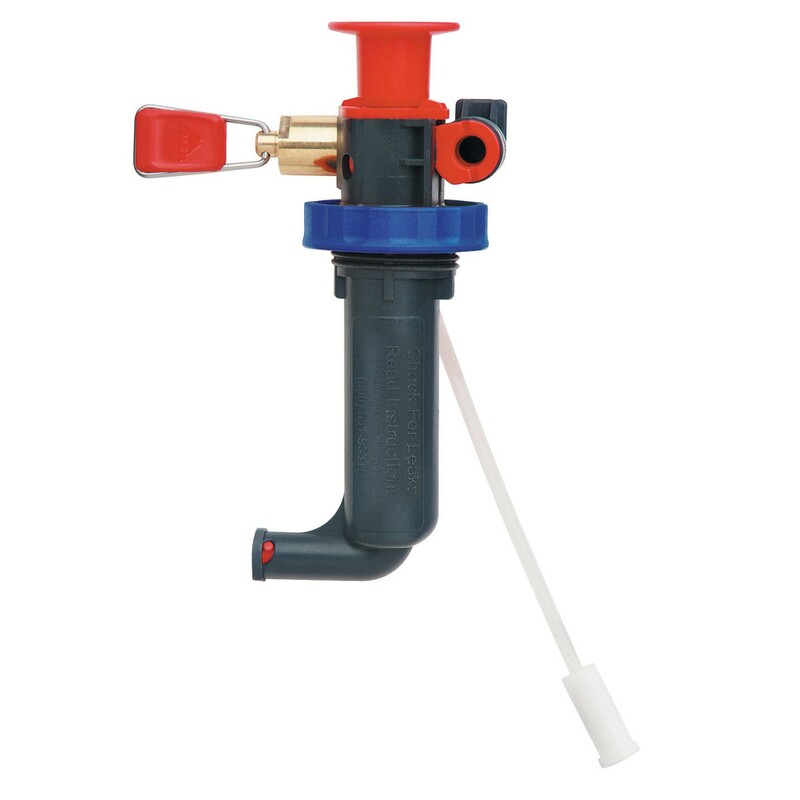 It has a regulated valve and it is designed to run with the canister upside down. Not only that, it has a heat exchanger pot. The heat exchanger causes more of the heat of the burner to get transferred to the contents of the pot. Why not just use White Gas or Kerosene? Oh, for crying out loud. I mean really, Jim. Why all this messing around? Why not just use white gasoline or kerosene? Well, yes, and many people will do just that. With a white gasoline or kerosene type stove, you don't have to worry much about the temperature of the fuel. Pressure is not provided by the fuel itself but rather by an external pump. Priming a liquid fueled stove (gasoline or kerosene) takes skill, dexterity (it's cold, remember), extra fuel, and extra time. In truly cold weather, one is often forced to cook in one's shelter. Do you really want to prime a stove inside a tent or other shelter? Pumps often fail in cold weather. Gas stoves are generally lighter and are more mechanically reliable than liquid fueled stoves. In truly cold weather, my recommendation is that teams coordinate carrying both liquid fueled and canister gas stoves such that there are back ups in case one or the other proves unworkable. Ideally, a backup pump (as well as a maintenance kit and spare parts) should be taken for each white gasoline/kerosene stove. By the way, MSR has just come out with a new pump, specifically designed for cold weather, the MSR Arctic Pump. It is not supposed to be used above 32 F / 0 C. It's seals and pump cup are designed to remain flexible in extreme cold. Canister pressure drops in cold weather. Canisters chill not only due to cold outside temperature but also chill from within during use. In order to maintain sufficient canister pressure, one must learn the basics of cold weather gas stove operation. See list of links, below. Technology can help augment the basics of cold weather canister stove operation. Using a stove designed for inverted canister operation. Regulator valve technology can be very helpful in cold weather, but regulator valves can only take one so far (and must always be used in conjunction with the basics of cold weather gas stove operation). Perhaps a practical cut off point for upright canister stoves is something on the order of -15 C (5F) – if you're using the basics of cold weather gas stove operation augmented by technology. A stove designed for inverted canister operation may be best for temperatures below those where an upright canister stove is typically practical. The two technological approaches can be combined and used simultaneously as in the Jetboil Joule. In extreme cold weather, teams should coordinate carrying a combination of canister gas and liquid fueled (white gasoline/kerosene) type stoves. This has been a long and complex post, a fact for which I apologize. I hope that you have found this useful. If not, then comment below and let's get it properly revised. If a picture is worth a thousand words, what's a video worth? Dunno, but here's a video showing an integrated upright canister stove in cold weather. You will notice that it is struggling as the canister cools from within. Part way through the video, I will place the canister in some lukewarm water, and... well, watch what happens. A few questions have come up since I posted my Review of the new MSR Pocket Rocket 2. I therefore have put together this, which acts as a supplement to my original review. The generations of the Pocket Rocket Line. I have purchased things in the past from LL Bean. I have no financial relationship with LL Bean other than that of an ordinary customer. I don't think, going on my memory which is far less than fully reliable, that I've ever purchased anything from Backcountry Gear. I certainly nave no financial relationship with Backcountry gear. The stove simmers well. I was trying to illustrate just how good the flame control is in Appendix II (which is well worth referring to). Let me here show a photo of the food as opposed to the flame. Look at the photo below. If you look a bit to the left of center. You can just barely see a few bubbles. Now that's a true simmer (a simmer being the ability to hold contents of a pot at or just below a low boil). And look at the food debris left on the sides of the pot. Only moments before, I practically had a boil over, things were boiling so furiously. That's some nice flame control. Note: The majority of the flame control occurs in the range of approximately 1/6th to 1/2th of a turn of the valve adjuster. You have to have a fairly deft touch, but with just a minimum bit of skill, you can have just about any flame setting you so desire. And now, a flame shot. I mean who doesn't love flame shots? But, seriously, look closely. That's a nice, low flame (and you can get it even lower) – with absolutely no spillage up the sides of the pot. This is just the flame control you want to have on a stove. I covered the subject in the general case in my Review of the new MSR Pocket Rocket 2, however, let me respond to one specific question and then give one more general example. First, the specific question: "How do the supports on the new Pocket Rocket 2 fit on an MSR Titan Kettle?" Presumably they were referring to the standard sized (850 ml capacity) kettle. Now, notice in the photo above that the inner circle of the bottom of the kettle match nearly exactly the inner diameter of the pot supports. With respect to the outer diameter, the pot supports extend a mm or two beyond the outer periphery of the kettle. I'd say that the Titan Kettle is a really strong candidate for use with this stove, particularly for a soloist. I think it a tad small for two. Incidentally, MSR has announced that they are coming out in 2017 with the "Big Titan Kettle," a two liter version of the current Titan Kettle. Why they went all the way from 850 ml to 2000 ml (two liters), I'm not sure, but that's my understanding. I typically recommend something on the order of 750 ml per person in terms of pot capacity, so a 2 L kettle would be a pretty good match for a group of two or three people. I haven't seen one. I'll keep you apprised if I get any further information. Now, for a more generic example: Here is a photo of the Pocket Rocket 2 with standard 355 ml (12 fl oz) beverage can. This particular beverage can has been made into a Trail Designs 12-10 alcohol stove, but the outside diameter of course has not changed. Now, the point here is not that you should use a Coke can to cook in, really it's not practical, but rather that this stove will support really small pot diameters. Note however that all you Heineken and Fosters "pot" lovers had best turn down the stove lest you ruin your pot. The valve block of the Pocket Rocket 2, to include the threads, is made from anodized aluminum. Note that this is not "hard" anodization (the type of anodization that makes aluminum pots tougher) but is merely the means by which the valve block has been colored that nice MSR red. The valve spindle, at least what I can see of it, is brass. I have not disassembled the unit (nor do I intend to), but presumably it is all made of brass. The valve adjuster handle is stainless steel. The valve block of the MSR Pocket Rocket 2 is made out of aluminum. Some stoves* will have a brass insert in the valve block for the portion that threads on to a canister. Brass generally wears a bit better than aluminum, but aluminum has not been shown to to be a poor choice of materials. Many a through hiker has done a long trail (for example the Pacific Crest Trail) without a problem. The threads on all canister gas stoves, whether brass or aluminium, will wear with time. Do not over tighten. *I just went into the gear room (the very room my wife detests but is of course entirely necessary) and pulled out a couple of canister stoves that my memory suggested had a threaded brass insert, specifically the Soto Amicus and the Snow Peak GigaPower. Both of those stoves do in fact have a threaded brass insert. I'm going to depart from the normal here and put a commercial link in a blog post. May my readers forgive me. Please understand that I derive NO BENEFIT from this post nor if you make a purchase*. This is just a good deal I noticed. Cold weather testing the WindMaster. It's no secret that I consider the Soto WindMaster to be the best quality upright canister stove on the market today. I believe I said as much in my review of the WindMaster. It's wind resistant in a way other stoves of this class just aren't (well, except for its budget minded cousin, the Amicus), and it's a good balance of versatility, efficiency, and weight. Not only that, it's just quality in every respect. That said, Campsaver.com has the Soto WindMaster on sale for about $20 less than MSRP. For your convenience here is a link: Soto WindMaster on sale at Campsaver. As far as I know, Campsaver is a reputable establishment. Friends of mine have had good experiences. However, note that I have never done business with them. Caveat emptor. This is information only; do with it what you will. Simul-testing the WindMaster against a "control" stove. The WindMaster is at left. No matter the conditions, the WindMaster always came out ahead – while using less fuel. I hope this is helpful to someone, and I do hope you will forgive the commercial intrusion on this, a site focused on what we do in our lives outside of work (well, unless you're a guide or something). *Note to Campsaver if you happen to read this: I can't be bought, but it wouldn't hurt you to try, now would it? I like dark chocolate. :) Seriously though, Campsaver, I've been Jonesing like mad to have a look at one of those Optimus Polaris Optifuel multi-fuel burners. Send me one, and I guarantee all other stoves will go on hold. I will straight away review the Polaris. I'm completely serious about this. You can leave a comment below and I'll get an email and physical address to you forthwith. Performance testing the Soto WindMaster against a "control" stove. Note: The individual in the photo is a highly trained stove professional. Don't try this at home (seriously, go for a hike; you have a much better stove already in your kitchen at home). Apologies for the waste generating food. We got a free case because they were due to expire. MSR is discontinuing the much venerated MSR PocketRocket. In it's place? The new PocketRocket 2. For those of you who are die-hard Pocket Rocket fans screaming "nooooo!" at your screen right now: Relax. There's a lot to like here, and you're giving up very little. Note: Gone as well is the Micro Rocket. The obvious gain here is in compactness. For example, no matter how you turn it, the original Pocket Rocket just isn't going to fit into a 550 ml mug shaped pot, the kind that a 110 g canister of gas nests in. You can't lay it flat, you can't put it in diagonally, and you can't stand it up straight. The original Pocket Rocket just won't fit in a little 550 ml mug shaped pot. On the other hand, the new Pocket Rocket 2 lays flat, no problem – a dramatic difference. The new Pocket Rocket 2 fits into a 550 ml mug type pot with room to spare. There's also a fairly significant weight reduction over the original Pocket Rocket. The new Pocket Rocket 2 weighs in at 73 g (2.6 oz) vs. 87 g (3.1 oz) for the original. The Pocket Rocket 2 weighs in at 73 g (2.6 oz). Now, some of you are no doubt saying to yourselves, "um, gosh, but the Pocket Rocket 2 looks a whole lot like the Micro Rocket." Well, if you were thinking that, you'd be right, BUT there's just a bit more to it than that. The Micro Rocket, left, and the new Pocket Rocket 2, right. With the Pocket Rocket 2 come much improved pot supports. The complaint with the Micro Rocket? It was a bit "iffy" in terms of pot stability with small pots. For example, if one were to use something small like, say, a Sierra cup, you were balanced on little more than a prayer. The pot supports on a Micro Rocket are just barely there with smaller diameter pots. On the other hand, with the new Pocket Rocket 2, you've got quite a bit of "contact length" with the pot supports. If you bump the stove or the pot otherwise shifts, you've still got a section of the pot supports in contact with your vessel, and nothing falls off. The greatly improved pot supports of the Pocket Rocket 2 offer a lot more support for small diameter pots, cups, or mugs. What's that? You use something a bit bigger than a Sierra cup? OK, great, but even if you use something bigger, the new pot supports are still better. The new pot supports are longer and have more teeth. If your pot shifts or gets jostled, there's less chance that your pot is going to fall. A dinner saved is a dinner eaten! The new Pocket Rocket 2, upper left. The Micro Rocket, lower right. More teeth (and longer) = better grip. These improvements in pot stability come at no cost in terms of extra weight; the Pocket Rocket 2 weighs the same as the Micro Rocket. Note: Nearly all I wrote in my review of the Micro Rocket applies to the Pocket Rocket 2. The original Pocket Rocket had an MSRP of $40. The Micro Rocket had an MSRP of $60. The new Pocket Rocket 2 has an MSRP of $45. I think this is good news. One receives all the benefits of the improved features and reduced weight of the Pocket Rocket 2 at only a nominal price increase over the original. MSR is basically merging the two product lines (Pocket Rocket and Micro Rocket) into one and passing on the cost savings to you, the end user. The Micro Rocket, left. The new Pocket Rocket 2, center. The original Pocket Rocket, right. I think this new stove is a win for someone like you or like I – a back country stove user. It looks like MSR just didn't find the two pronged approach of having two very similar stoves (the Pocket Rocket and the Micro Rocket) advantageous. So, they've decided to cut costs – while at the same time improving the stove overall. In so cutting, they're able to offer a better stove, the Pocket Rocket 2, at a much cheaper price. Whereas one formerly had to pay a premium to get the compactness and lightness of the Micro Rocket, now one gets the improved features and reduced weight at a very much reduced cost. There is additional information in the appendices, below, about flame control, height, and other changes. For availability and technical data, see Appendix I. For disclosures, see Appendix V.
Lastly, is the new Pocket Rocket 2 revolutionary? Well, it's a heck of a lot better than the original Pocket Rocket, but... there's not a huge difference over the Micro Rocket (although there are the improved pot supports). Still, it's a good solid stove at a price that is in line with comparable stoves – and at a price well below what one formerly had to pay for this level of features. So, the Pocket Rocket is dead, but long live the Pocket Rocket 2! Good flame control – see Appendix II, below. What's not so good about it. The tops of the pot supports aren't completely level when fully deployed. The supports all slope downward into the center toward the burner. Better grip would be achieved were the tops of the pot supports all level (i.e. in the same plane) similar to how the Soto Amicus is configured. The open burner is vulnerable to wind. A further weight reduction would have been most welcome at this juncture. The MSR Pocket Rocket 2: Highly recommended. Manufacturer: Mountain Safety Research (MSR), a subsidiary of Cascade Designs. Packed dimensions: 1 11/16" x 1 11/16" x 3" (43 mm x 43 mm x 76 mm). Size/Model tested: Pocket Rocket 2. Colors available: Silver with a red valve block. Warranty Information: Contact Cascade Designs through their website (see above). Flame control on the new Pocket Rocket 2 is good. The flame ranges from a very robust full power flame. The Pocket Rocket 2 – full power. To a very nice moderate flame. The Pocket Rocket 2 – medium flame. To a nice low, simmering type flame. The Pocket Rocket 2 – low flame. With small pots, of course you want to turn the flame down. High flame on a small pot is going to result in flames spilling up the sides of the pot – and going to waste. The only efficient flame – especially with small pots – is a smaller one. Never exceed the diameter of your pot. A flame, properly adjusted, never exceeds the diameter of the pot. Notice the contrast in flame sizes between the above two photos. Yes, you'll boil faster with a larger flame. You'll also burn through a lot more gas. There are a few changes as the original Pocket Rocket and the Micro Rocket go the way of the Dodo (i.e. extinct). There's a new, much easier to use case for the Pocket Rocket 2. The original Pocket Case wasn't bad, but it was a bit bulky, and sometimes it would warp a bit making it hard to get the stove in and then close the case. The original Pocket Rocket's case, left, the Micro Rocket's case, center, and the new Pocket Rocket 2's case, right. The new Pocket Rocket 2 case opens easily like a treasure chest, and it's a lot easier to get the stove in and out. The Pocket Rocket 2 in it's completely re-designed (and much improved) case. Gone also is the Micro Rocket's little hand held piezoelectric ignition. I think there is little lost here. If you're going to carry a separate ignition, you might as well just carry a regular butane lighter. A regular lighter will be a lot more versatile in that it can also light paper, wood, etc. whereas a piezoelectric ignition only lights your stove. However, if you like the hand held piezoelectric ignition, you can still get either MSR's (presuming they're still going to carry it) or Kovea's which is identical to the MSR except for the color and the logo. There's room in the case if you decide you want to carry one. The new Pocket Rocket 2 doesn't come with a hand held piezo ignition, but there's room in the case if you want to carry one. The ignition in the above photo is from Kovea but is identical to the one sold by MSR except for the color and logo. The height of the new Pocket Rocket 2, when fully deployed, remains consistent with the original Pocket Rocket (as well as the Micro Rocket). The original Pocket Rocket, left, the Micro Rocket, center, and the new Pocket Rocket 2, right – all about the same height. The stove featured in this review was provided to me at no charge by MSR. I have no financial relationship with MSR. I do not receive any compensation from MSR for this or any other review except that I typically get to keep the stove. I have pretty much every MSR stove known to man including many stoves that no longer exist (Firefly, Rapid Fire, "G" stove, Simmerlite, non-shaker Jet Whisperlite, etc. ), so one more stove isn't a particularly big deal to me and certainly did not influence the way this review was written. I go out of my way to be thorough and objective in my reviews. Here's an example of how I calculate the amount of fuel needed for a given trip. You should be able to do something along these lines and come up with a number that will work for you. Planning for a trip in the back country? Sounds fantastic. Um, how much fuel are you going to need for that? First, I write down when and how much I'm going to boil throughout each day. For example, look at the chart below. I typically boil two cups (about 500 ml) of water per meal for breakfast and supper. Maybe I'll boil a little less for breakfast. I typically have a cold lunch. I also like to have a cup of coffee or tea in the morning, and then a cup of cocoa or tea in the evening, which means I'll boil another two cups per day for hot drinks. I typically use cold water for cleaning up after supper, so no fuel consumption there. Given all of the above, I'm going to boil about 1500 ml per day. OBVIOUSLY this is just an example, and I'm making everything uniform so it's easy to understand. In real life, the amount you boil may vary from day to day depending on your menu, how much you eat, whether or not you use hot water for personal hygiene or dishwashing, etc. This example is all about round numbers and easy to follow calculations. The numbers are reasonable, but of course you need to adjust everything to how you cook, how often you cook, how many people you cook for, etc. Wow. Looks like a beautiful spot. How many days will it take you to get there, how many meals will you eat on the way, and how much fuel do you need? Second, I write down how much fuel it's going to take to boil each amount of water I've written down in step 1. For most stoves, that's about 7 or 8 g per 500 ml boil although you can get by with less if you follow the rules of stove fuel efficiency. NOTE: If you use a Jetboil or other similar integrated canister stove or you use a heat exchanger pot, then instead of 7 to 8 g being the typical amount of fuel needed to boil 2 cups of water, you might plan on 5 to 6 g of fuel per boil. Yes, you'll have to adjust these numbers. Again, this is just one example, using the "backpacker's standard" of 2 cups per boil, which is about what most freeze dried meals require. As you adjust these numbers, remember that it's more efficient per cup to boil a larger quantity than a smaller. In other words, if 2 cups requires, say, 8 g (4 g per cup), 3 cups might only require 10.5 g (3.5 g per cup), and 1 cup might require 4.5 g. Something like that. You need to adjust all these numbers based on your experience of how much fuel you actually use. For this example, I'm going to choose a number of 8 g per 500 ml boiled which is neither overly generous nor overly optimistic. Nice spot to camp. It'd be a shame to run out of fuel and spoil such a perfect camp. Third, I total up the amount of fuel that I'll need for the whole trip by summing the amount needed for each day. Many people do not cook breakfast on the first day or supper on the last; in that case you would need to adjust these calculations. This total amount needed has to be less than the amount contained in whatever canister I intend to bring. You should also add a "margin for error," particularly on cold weather trips. The more experience you have, the smaller margin you can plan on. Given the example presented in the chart, below, I need about 96 g of fuel for a four day trip or about 24 g per day. Yes, I know we might get better actual results than 8 g per 500 ml boiled which would give me different numbers, but let's just go with 8 g per 500 ml boiled for this example. If I need 96 g of fuel, and I take a 110 g canister of gas, I would have 14 g as a margin for error. You'd have to think about whether or not that's going to work for you. If the weather's warmer, then maybe that's fine. If it's colder, maybe plan on more. If you're with a group, maybe that's fine. If you're going solo, maybe plan on more. And so on. Think it through and bring the the amount you feel comfortable with. East Vidette as seen from the John Muir Trail. Don't let poor planning ruin your dream hike! While these numbers in the below chart aren't actual data from a trip, they're within the realm of reason. Therefore, allocating 25 g of fuel per day isn't unreasonable until you get a better sense of how much your cooking actually requires. Twenty five is a fairly easy number to work with, and the most commonly used canisters contain about 100, 200, and 450 grams of fuel. Twenty five divides easily into 100, 200, and 450. NOTE: For your first several trips, if you're new to backpacking, assume you'll need more fuel rather than less until you get a feel for how much fuel your style of cooking actually requires. Note: All photos are from my 2015 John Muir Trail section hike (Onion Valley to Whitney Portal). The author, out on the trail where he belongs. Why on earth am I indoors blogging on stoves right now? Who is making the highest quality backpacking stoves available today? At least in the US market, it's Soto Outdoors of Japan. Their latest entry is the Soto Amicus (OD-1NV), an upright canister stove. What's All This About the Soto Amicus? What's an upright canister stove? Please see my recent blog post: What is a Remote Canister Stove? which describes the two major types of canister gas stoves (upright and remote) and lists the advantages and disadvantages of each. It's worth knowing the difference. The Soto Amicus is a small, relatively lightweight, relatively inexpensive upright canister stove. There are dozens of such stoves available on the market today. How is the Amicus any different from any other stove? Well, the Amicus is the best built of the lot and has a really nice design, but that's not what sets it apart. Soto claims that they have developed a new type of burner head, one that can handle wind better than other stoves. This windproofness would set the Amicus apart from other stoves. So, either the Amicus handles wind better or it's really nothing special. Therefore, wind testing was the major focus of my field testing. Is Soto just "blowing smoke" or are they really on to something here? See the sections on "Wind Testing" and "The Bottom Line in Wind," below. Who is the largest auto maker in the world? Well, it used to be General Motors, an American corporation, but now, it's Toyota, a Japanese corporation. Why? They build a better automobile. We've seen this transition from American corporations to Japanese corporations in many fields such as bicycles, electronics, fishing gear, etc. Typically, the Japanese engineering, ergonomics, and build quality is just plain better, and people are willing to pay more for it. We may now be seeing this trend in backpacking gear as well. Montbell (of Japan) is a much sought after brand among backpackers in the know. Evernew (again, of Japan) makes some of the best ultralight titanium pots. And Soto makes the best backpacking stoves available today. The Soto Amicus deserves an award for excellence in engineering. Such attention to detail. Soto's engineering and build quality is beyond reproach, but that doesn't mean that they've always read the market perfectly. Their first upright canister stove available in the United States, the Micro Regulator, was a good stove and was met with wide acceptance, but there were those who found the pot supports "fiddly" (they had to be first moved to a particular spot on their arms and then rotated into place) and didn't like that sometimes the pot supports would flop down when there was no pot on when the stove was moved. Soto then came out with the WindMaster, which I consider to be the best upright canister stove available in the US market today. For those who are interested, I have a review of the Soto WindMaster available here on my blog. Again though, the pot supports were "different." They detached when the stove was packed away. The detachable pot supports could easily be lost if one were not careful. I myself was not bothered by this; I simply used a micro carabiner to clip the detached pot support to the valve handle of the stove the minute I took the pot support off. However, a lot of people just absolutely hated this feature. On this, the Soto Amicus, Soto's third entry of this type into the US market, I think they've finally gotten it right. One does rotate the support into place, but on the Amicus, one does not have to find the "sweet spot" on the pot support to get it to rotate. One simply pushes it up into place in one smooth, effortless motion, and, once in place, they're not going anywhere. One has to push up and then push out, against the spring loading, to retract the pot support. It's easy to retract the pot support, but it's unlikely to happen on its own. The spring loaded pot support rotates into place in one smooth motion and then clicks onto a hook and stays put. Nice. The pot supports are literally so simple that a child could do it. The pot supports? So easy that a child can do it. And they work. Not only are they easy to extend and retract, not only do they stay in place once set, they're just danged good pot supports. Of its class, the Amicus has the best pot stability that I've seen. The WindMaster, if one gets the optional 4Flex pot support, has far better pot stability, but the WindMaster is a larger, more powerful, ultralight stove and is really not in the same class as the smaller, budget minded Amicus. The only stove that really comes close to the Amicus in this class is the Snow Peak GigaPower. Part of why the Amicus has such good pot stability is that it has not the typical three but rather four pot supports. The Amicus also has more "teeth" on it's pot supports than most stoves, and those teeth are precisely made, gripping pots better. Many pot supports on other stoves are a bit rounded off, and they just don't grip as well. My daughter demonstrating the stability of the Soto Amicus with a 1.9 L pot, which is a pretty good sized pot for such a little stove – but it's really not a problem with the Amicus. The Amicus is a fairly small stove. It's about the width of my hand. The diminutive Amicus. It packs down small. When the pot supports are folded away, it packs down pretty small. It fits easily in a 550 ml mug type pot. However note: While I could get the Amicus and a 110 g sized canister of fuel into the 550 ml mug type pot, I could not close the lid. However also note, I'm not aware of any stove that could fit in my little mug type pot along with a 110g canister with the lid closed although the Snow Peak LiteMax comes very very close. Even the Optimus Crux, which is a pretty flat stove when the burner is folded, cannot fit in this 550 ml mug with a canister and have the lid closed. The Amicus is about as packable as an MSR Micro Rocket. A Snow Peak GigaPower is slightly more compact. An Amicus far more compact than the MSR Pocket Rocket. The Soto Amicis is more compact than either the Soto Micro Regulator or the Soto WindMaster. The Soto Amicus in a small 550 ml mug type pot. One of the outstanding features of the Soto line of upright canister stoves is their "Stealth" piezoelectric ignition system. The wire is run up through the burner column (rather than being on the outside), and the spark point is in the center of the burner rather on the rim. The Soto ignition is far less likely to snag on things and is less obtrusive. The simple red button and housing of the Amicus' excellent piezoelectric ignition. Notice how there are no exposed wires and that there is nothing mounted to the side of the burner. With the spark point of the Stealth ignition located in the center of the burner, it is not directly in the flame, giving it an edge in reliability over other ignition systems. The silver strip of metal in the center of the burner head is the spark point of the Amicus' excellent Stealth piezoelectric ignition. Of all the stoves I have in my collection that have various forms of piezoelectric ignitions (I have at least 10), the Soto ignition system is far and away the most reliable, most sophisticated, and least obtrusive. No one else in the industry even comes close to the quality and reliability of the Soto Stealth Ignition. That said, "good" and "perfect" are not one in the same. The Stealth ignition is the best in the business (nobody else really comes close), but even the best ignition is subject to breakage or failure. Always carry a second (or third) source of ignition such as a lighter, matches, or fire steel. Note that the Stealth ignition is optional. A version of the Soto Amicus is available without the ignition. The Soto Amicus weighs 2.6 oz/75 g in the version without the Stealth ignition. The Soto Amicus weighs 2.9 oz/81 g in the version with the Stealth ignition. However, on my scale, the Amicus with ignition weighs 2.8 oz/78 g. For comparative purposes, I'll list the weights of several stoves in the same class. For reference, I'll also list the weights of the other two upright Soto canister stoves even those are higher end stoves and are not in the same class. These weights were all measured in grams by me on my scale. Weights per the manufacturer may differ. The weight of the Amicus is generally in line with other stoves of its class, however there are higher end stoves like the Snow Peak LiteMax that are quite a bit lighter. There are also some really inexpensive stoves coming out of China like the FMS-116T at 1.7 oz/48 g (sold in the US as the Olicamp Kinetic Ultra), the FMS-300T at 1.6 oz/45g (sold in the US as the Olicamp Ion Micro), or the incredibly light BRS-3000T at 0.9 oz/25 g. Note however that none of the stoves out of China has anywhere near as good pot stability, and neither do they have the sophisticated ignition of a Soto stove. But each to his or her own I suppose. In addition, it is worth noting that Japan has some of the highest gas stove safety standards in the world. I am not aware of any Chinese stoves that have been able to meet the strict Japanese standards. I have seen some US (Coleman) and European (Primus) brands on my trips to Japan. The BRS-3000T is not to my knowledge certified to operate in the US. You can get one sort of "under the table" on eBay or Amazon, but no company sells it in the US. If the stove causes an injury or fails, you have little legal recourse. Canister gas stoves generally cook well. They have a highly adjustable flame. If you adjust the flame well and have appropriate cookware, there isn't really much in the way of limitations to what you can cook. The Amicus is no exception. On the Amicus, I was able to get a barely there flame capable of a very low simmer. OK, now to the heart of the matter. As I said in the beginning, either the Amicus lives up to its claims of windproofness or there's really nothing that sets it apart from a whole host of similar stoves. Sure, the Amicus has better build quality and the really nice Stealth ignition – which absolutely should be considered when evaluating a stove, but those qualities alone aren't enough to make the Amicus truly stand out. On the other hand, Superior wind resistance would absolutely put the Amicus ahead of the pack. But first, why should anyone care about wind? Well, in the extreme, a stove can just plain blow out, and blow out so often that one just can't cook with it. See the rather dramatic first video in Windburner vs. Jetboil Wind Testing. But that's the extreme case. What about more typical winds? Well, depending on the circumstances, wind can really cut your fuel economy. Instead of the heat going into the pot, the heat gets blown out and away and is wasted. Whereas you might normally be able to boil 500 ml of water with 7 g of fuel, in wind, you might take 10 or 11 g of fuel. If you normally use 25 g of fuel per day, you're on a four day trip, and you're carrying a 110 g canister of fuel, you can't afford to be burning an extra 3 to 4 g of fuel per 500 ml boiled. At 3 to 4 g extra per 500 ml boiled, you're talking about something like 6 to 8 g extra of fuel per day which over four days equates to 24 to 32 g more fuel needed than usual – you're going to run out of fuel before the end of your trip! Note: The above numbers are intended to be illustrative. I chose 25 g per day because 25 is easy to work with when you have a four day trip and canisters are between 100 g and 110 g in capacity. They are reasonable numbers, but they are not not actual observations. See Calculating the Fuel Needed for a Trip for how to calculate gas consumption for a trip and for how I got the quantity 25 g.
A stove with better wind handling has more constant fuel consumption which allows you to plan more accurately so that you don't run out of fuel. Of course you're going pick a sheltered spot to cook and all that, but still, wind can make your stove unpredictable. So a stove that can handle wind well is a desirable thing. So, how did the Amicus do? Well, check out the below video. I'm just using my iPhone to shoot the video, so you'll have to turn up the sound. Basically, I found Soto's claims to be true. This isn't all that surprising given that I had already established that their WindMaster was better in wind than other stoves. See the video in my review of the Soto WindMaster. But I couldn't just assume that the Amicus would be as good. Yes, the Amicus did have the same type of semi-enclosed, concave burner head, but the Amicus' head was smaller and farther away from the pot. How did I establish that Soto's claims of superior wind handling are true? By running simultaneous test after test after test. Side by side, simultaneous testing of the Soto Amicus vs. the Optimus Crux. My "baseline" stove was the Optimus Crux. Both the Crux and the Amicus are rated at 10,200 BTU's. In still air, they both boil water in about the same time; there's no significant difference in boil time between the two. However, as soon as the wind kicked up, the Soto Amicus always pulled out ahead. Both stoves took longer to boil in wind, but the Crux was far more affected. Just in observing the flame, I could see that the Amicus' flame was far less affected by wind. A highly trained Adventures in Stoving engineer observing the flame characteristics of the Soto Amicus in wind. Not only could I visually observe that the Amicus' flame was far less affected, I could run the Amicus at a far lower setting. As low as I could turn down the flame, the Amicus never blew out. Not so with the open burner Crux. I was doing a simmer test with the Crux, the flame was steady and had been running for some time, but when a gust of wind came through, the Crux blew out, and I had to re-light the stove. But it is the boil times that speak the loudest. The normally equal Amicus would boil 40 to 45 seconds faster than the Crux in moderate winds with occasional gusts. Clearly, the Amicus is the better stove in wind. Are these results fairly universal? I mean I just tested the Amicus against one stove, right? Well, it is true that I did test against just one stove, but burner heads are fairly generic. With open burner heads, the flames are just more vulnerable. In addition, I got the same results with the WindMaster (which was tested against a different stove). The Windmaster has the same type of burner head as the Amicus. I am therefore pretty confident that the Amicus will fare better in wind than any unprotected burner head. Now, does this mean that you can cook in gale force winds with the Amicus? Uh, no. If you want that kind of windproofness, you've got to go with something like the MSR Windburner or the MSR Reactor. The Amicus will be far more consistent and predictable than other stoves, giving you the ability to a) plan more accurately, b) conserve fuel, and c) simmer better in wind. The $40 MSRP of the Amicus (without ignition, add $5 for the ignition version) is something of a first for Soto. Soto has heretofore introduced fairly high end stoves. Their first upright canister stove available was the Micro Regulator, MSRP $70, and their second was the WindMaster, MSRP $75. The Amicus, with ignition, has an MSRP of $45, and without ignition, the MSRP is $40. This is a huge jump in affordability for a Soto stove, and you're getting a heck of a lot of quality and functionality for that low price. As of 7 December 2017, Backcountry Edge has the Soto Amicus on sale for $31.96 without ignition or $35.96 for the version with the ignition. That is a steal of a deal. Note: I have a) no financial relationship with Backcountry Edge, and b) I have never purchased anything from them. This is just information; this is not a recommendation. Caveat emptor. It's a little heavier than I would like. In conclusion, as I reflect on the Soto Amicus, I find that there isn't much that I dislike about it except that perhaps it could be a bit lighter. It's a nice stove that's head and shoulders above the other stoves in its class. As always, I thank you for joining me. Packed dimensions: 1 9/16" x 1 9/16" x 2 7/8" (40 mm x 40 mm x 73 mm). Unpacked dimensions: 4 1/8" x 4 1/8" x 3 5/16" (105 mm x 105 mm x 84 mm). Size/Model tested: The version with the Stealth ignition. Warranty Information: Contact Soto Outdoors through their website (see above). The stove used in this review was provided by Soto Outdoors at no cost to me. Inasmuch as I own three other Soto stoves as well as over 100 other stoves of various types, sizes, and vintages, a free stove is highly unlikely to influence my review one way or the other. I have reviewed this stove as objectively as I am able. I have had no business dealings with Soto Outdoors other than to contact them in order to obtain the stove used in this review. I receive no remuneration from Soto or anyone else for my reviews. I receive no benefit when someone purchases a Soto stove. I do own multiple Soto stoves; all such stoves were obtained through third parties except the stove used in this review. In addition, just so you know, I earn very little from this blog – typically about a dollar a day, maybe a little more. I've earned $30.71 according to Google for this month. That's enough to pay for hosting fees and for fuel, so in that sense the blog is self-supporting, but that amount of money is nothing when one has a family of three to feed, house, etc. Basically, this is my oddball little hobby, and that's about all it is. This section has been moved to a separate blog post: Calculating Fuel Needs. What is a Remote Canister Gas Stove?